1 of 1 In a skillet, cook 4 beaten eggs in 1 tbsp oil; slice cooked egg and reserve. Add 1 tbsp oil, 2 ribs sliced celery and 1 each sliced onion, green pepper and carrot. Cook 6 minutes. 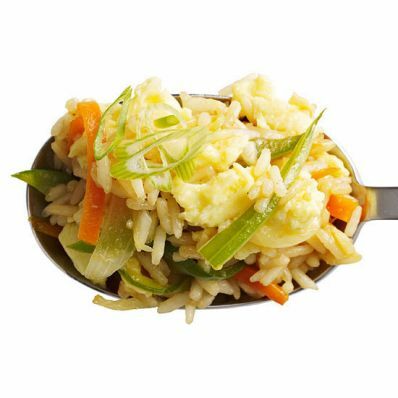 Stir in 3 cups cooked rice, 1/2 cup vegetable broth, 3 tbsp soy sauce and 2 tbsp ketchup. Heat; stir in egg. Top with 2 chopped scallions. Serves 4.